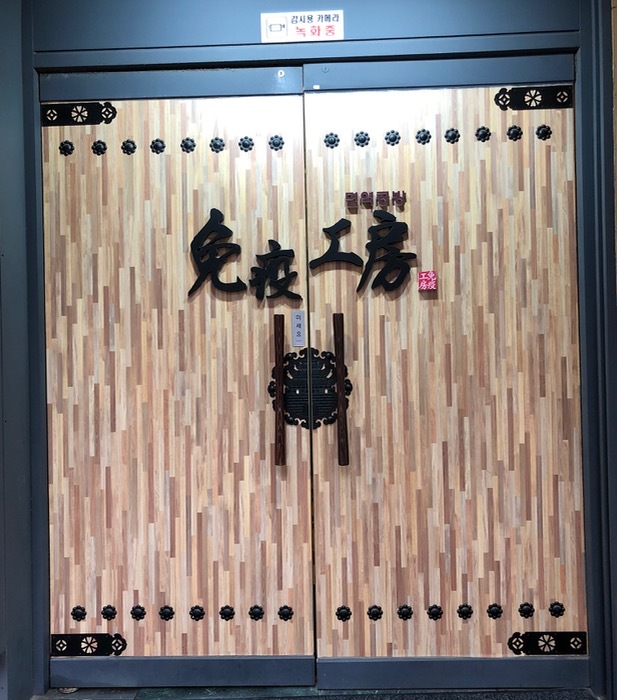 Posted on December 13, 2017 by Elizabeth E.
It was the last day of our trip to Tokyo and Seoul. I was laying in bed, so so tired from our trip, and already the events and obligations of home were pressing in. I communicated to my husband that all I wanted to do that day was lay in bed. He leaned over and said “There’s a quilt museum here in Seoul.” I was dressed and ready to go in a flash. 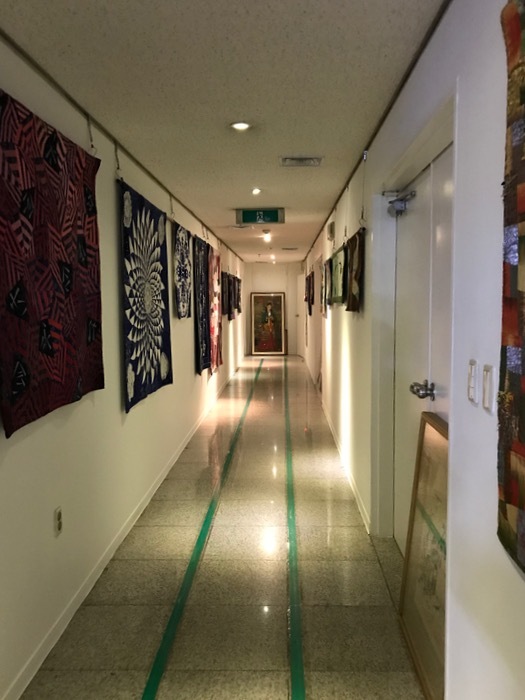 The Chojun Textile and Quilt Art Museum wasn’t too far from our hotel, up a narrow street, and it is very small: a room for the entry, a side room for the gift shop and more, a hallway and a one-room display. Right off the bat, we see Yvonne Porcella’s quilt hanging up on the right side of the display room. When we were talking about it, the assistant curator, Jeehye OK, who spoke English and was a good guide and help, lifted it up to see if there was a label. There wasn’t, but instead a hand-written note on the rod pocket: “Top.” The quilt was displayed upside-down, but apparently the curator likes it that way. I wondered if it were because of the way language functioned in Korea until the early 1990s: written right to left, but I’ll never know. This quilt was on the left side of the door. Again, no name or title. Most of the quilts were down a long poorly-lit hallway (below), but my husband’s camera picked up amazing amounts of info in dim lighting. 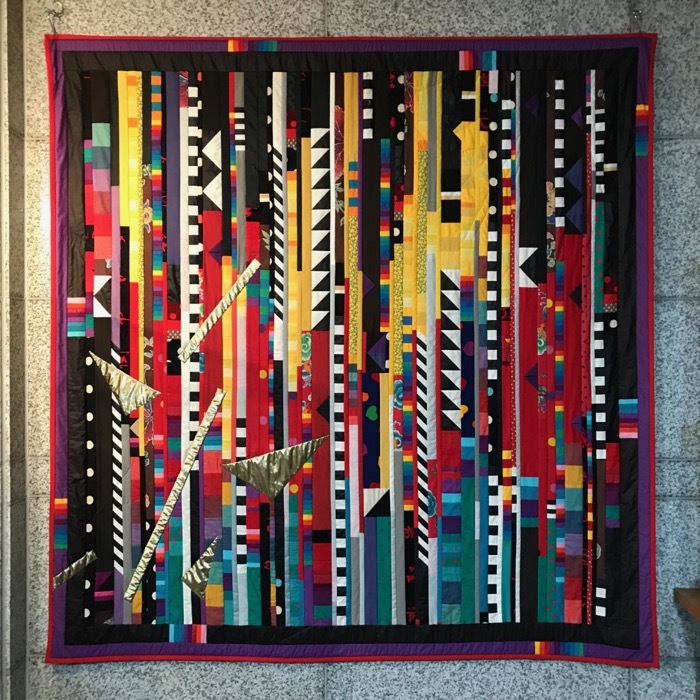 You can click on any quilt to get a larger photo. What I found interesting were the colors they used, the placement of motifs or accents, and the general symmetry of the quilts. The little birds are just a photo fragment of a quilt–I thought they’d be cute improv pieced as a filler block. 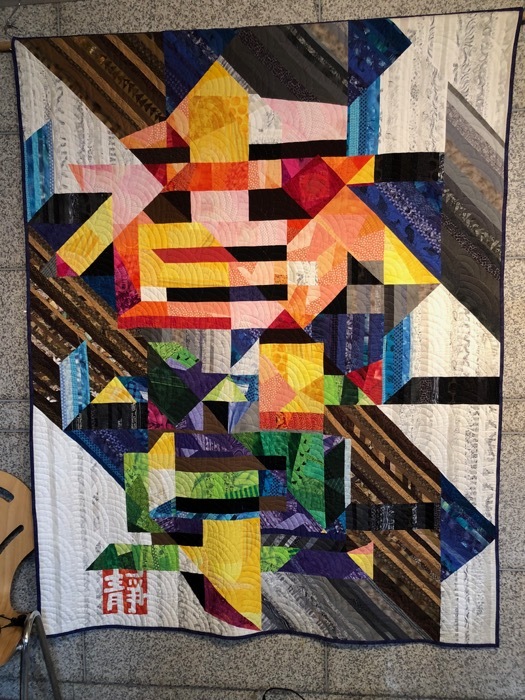 This exhibit was also shown at the International Quilt Study Center and Museum in Lincoln, Nebraska. This is what we saw when we entered, and immediately I leaned over for a closer look. All these contemporary bojagi were made by local artists, demonstrating the concept of pieced cloth. They appear to be all sorts of organdy, printed organza and perhaps some chiffon here and there? I said to Dave that they must have gone shopping at Dongdaemun to get this range of cloth. I don’t think I could find this many kinds of sheer cloth in this range of colors here in the States. I also think their jeogori (or the little top with sleeves) is longer on the artists’ interpretations, than in the traditional versions. I like the bit longer one better. This is the more traditional woman’s hanbok with the long bib-front. I think this is the perfect outfit for the mature woman (forget Kimono, which show everything!). The woman’s outfit also has an underskirt, an overskirt that in the past was nothing more than a gathered length of cloth on a band which was tied tightly above the bust But now there are straps to keep it from falling down (all this is from Jeehye, who as very patient with my questions). Men’s, with close-up of the embroidered panel. Most of these photos were taken by my patient and understanding husband, while I chatted. Jeehye and I, in front of Porcella’s quilt. I did some research and found that many would-be-sewers of hanbok used this Folkwear pattern as a basis for their costume. Tempting, but how will I finish all those UFO quilts hanging around on my guest bed, if I attempt this? I do have a modern-day Seoul fashion story for you, though. It’s about a purse just meant for quilters. The last night, we were over by the Shinsegue Department Store to look at their lights, and as we were wandering through the store, I stopped in my tracks: The Purse! And of course, it was by Issey Miyake (slaps head). The way it draped and moved, was beyond amazing. So was the price tag. I snuck a few photos (asked permission, finally, and the sales clerk said it was okay), and snapped a few more. Sigh. Fast forward a few days, when I was talking to my sister, who is totally with it in fashion, unlike me. “Oh,” she said. “That’s been around so long there are knock-offs.” Cue up Amazon, type in BaoBao, and after a few mouse clicks and a couple of days, the aqua knock-off arrived in my kitchen. I plan on bringing it to all the Quilt Shows, as it is definitely a purse for quilters: very cool, very light and holds a lot. So, no hanbok for me, but yes! to a geometric purse and yes! to bojagi patchwork. Now it’s back to those UFOs on the guest bed. Oh, and maybe get ready for Christmas!